The fourth issue of Robert Kirkman and Paul Azaceta’s breakthrough bestselling series, OUTCAST BY KIRKMAN & AZACETA, sold out instantly and immediately following the announcement that Skybound/Image Comics would send the series’ first issue to its final printing. Issue #4 is now headed back to press for a second printing as well. Readers can’t get enough of the demonic possession thriller and the recent news that a television adaptation is underway has lit the series’ readership interest on fire. The new horror series follows the tormented Kyle Barnes—a man with a burdensome gift—and the series of chilling demonic possessions he encounters. In issue #4 one Luke Masters, a new and pivotal character, is introduced and Kyle’s journey twists down an unlikely path. OUTCAST BY KIRKMAN & AZACETA #4 remains available for purchase across all digital platforms, including the Image Comics website (imagecomics.com), the official Image Comics iOS app, Comixology’s website (comixology.com), iOS, Android, and Google Play. OUTCAST BY KIRKMAN & AZACETA #1, 5th printing (Diamond Code AUG148326) will be available on 10/22. 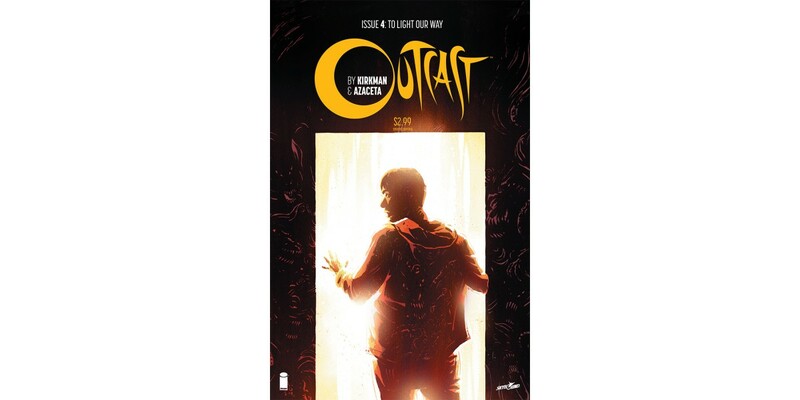 OUTCAST BY KIRKMAN & AZACETA #2, 2nd printing is available with Diamond Code JUN148240. OUTCAST BY KIRKMAN & AZACETA #3, 2nd printing is available with Diamond Code JUL148428. OUTCAST BY KIRKMAN & AZACETA #4, 2nd printing (Diamond Code AUG148350) will be available on 10/29. OUTCAST BY KIRKMAN & AZACETA #5 is available to pre-order with Diamond Code AUG140667 and will hit shelves on 10/29.